I am currently 19, But I'll call myself 20. Seeing as it's my only language. I would say i speak English, fluently. How often could you be on the server:. I have roleplayed for nearly half my life. From actual acting in a charity haunted house, to running a small DnD campaign at school. I have been a paldian in one RP, to a mass murdering F-Head in the next. Metagaming is knowing something yourcharacter wouldn't. Example. Somone OOC, says a secret with another player OOC on the forums. Your character would not know such information, and thefore not able to use said information in the RP. Powergmaing, is what I refer to as God-Modding. Example. Person A types. "I am a Demi-God from Venus. Here to make everyone wealthy and drunk!" Person B types. -throws dagger, into person A's neck. Killing instantly. Not giving person A any time to react, or giving him any time to enjoy the RP. Like I do everything else. I google'd Steampunk Texturepacks' Found Glimmars, which led me here. -nods- I have, and do. Aquil. The 'Gods' have done nothing for me, I believe in none. I wear bronze armor, polished nearly to a gold shine. It was my father's armor, and his father's before him. I wear it now, seeing as I am the last of my family. I was born in a small town, I believe it was named 'Neet'. I was young when it burned. My father, my mother, and I retreated from town and hid in the nearby forest. My father, being our clan's warrior, head back into the blaze to fight. My mother followed, and i was left alone, and in the cold. I was there, in those woods, alone, till morning. When the sun rose, I walked into my village. The vision was completely different. I was no longer standing in Neet, but a ashen wasteland. A wasteland with nothing but an name. It was there, I found my father's corpse. I removed his armor, and wore it as my own. Swearing I would find the men, or man who burned my village, and destroyed my family. I am the best with a sword. A blade in my hand, would make me unstoppable. I have only lived by the blade, and I expect myself to die by it as well. But a great warrior knows his weaknesses. I am quick to judge, I'm alone and easy to manipulate into trusting others. i believe my compassion shall be the death of me. Aramil rode in a small navy ship. He was only a traveler, and the Navy captain was the only one who let him onto his ship. Truth was, Aramil had finally found a lead about a group of bandits who was terrorizing villages across the sea. And if anything, that group of bandits would know there enemies and rival camps. He would kill everyone, save the leader. And get the location of all the camps. Aramil would find the group that burned his village, until his dieing breath. As night fell, aramill was woken. By the sound of the captain drowning. Pirate's had invaded the ship. Aramil drew his broadsword, and fended off the pirate attack as best as he could. The pirates came in massive waves, never ending it seemed. The cabin bow, a man of 24 it seemed. Threw a harpoon with a lit flint on it's tipped prong. The first mate threw the harpoon, and lit the pirate's rum cache. The pirate's soon retreated, their ship burning in the horizion as teh young cabin boy steered the ship to safety. Aramil congradulated the new captain, the young Cabin Boy. This is the skin currently on your character. 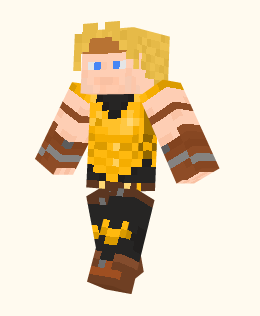 If it's not the right one, put the right one on and visit www.minershoes.com and put in your MC name (case sensitive) into the spot below the 3D minecraft character on the page. Hit enter and it should load up whatever skin you currently have on.